As the owner of Custom Marine Canvas in Noank, CT, Katie Bradford has turned her passion for sailing and sewing into a successful business. She’s also the Co-founder and President of New London Community Boating, a non-profit organization that has introduced hundreds of kids to the sport. A Past Commodore of the Eastern Connecticut Sailing Association (ECSA) and the Mystic River Mudhead Sailing Association, Katie enjoys competing on the ECSA Offshore Circuit and in the Mudhead ‘Donzo’ Wednesday Night Race Series. 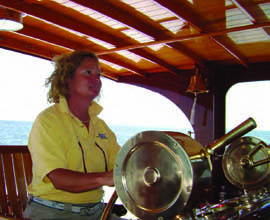 She also likes0 sailing her restored 23-foot Seacraft.